Extend your lift capacity with the range of Faresin Telehandlers. These quality Italian made Telehandlers range from 2500kg to 5500kg. We are sure to have you lifting and shifting with ease. The Faresin Telehandlers are easily manoeuvrable and almost limitless in use. Being flexible in application but still high performance makes these machines the perfect addition to your agricultural operation. The Agri Pack – A Faresin Exclusive – Double the productivity of your tele handler and add the Agri Pack, a set of rear remotes and 3pt Linkage ideal for that extra machine for hay work, towing a slasher or trailer. 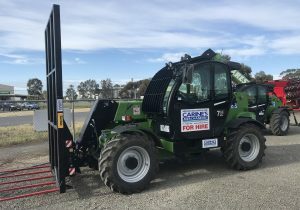 Faresin 7.45 Telehandler now available for hire from Carine’s Merchandise. Available for day hire or at a discounted weekly hire rate. Visit the For Hire page for further information.